To reach the main lodge room at Blackpool Masonic Hall from the comfort of the lounge bar, one leaves the latter, if one can bear to tear oneself from the genial atmosphere constantly prevalent, by way of the main entrance and ascends the stairway. On arriving at its summit, one makes a sharp left turn and enters over the threshold and into the magnificent opulence of ones intended destination. Tony Harrison (left) congratulates the new master Marin Sirbu. If one wishes to avoid straining ailing knees and hips to such an extent, the lift, (or elevator to our American cousins), offers a more comfortable and less strenuous alternative route. Either way, the journey is well worth the effort for the lodge room is considered one of the finest in the Province of West Lancashire and a befitting setting in which to welcome the Provincial Grand Master Tony Harrison. 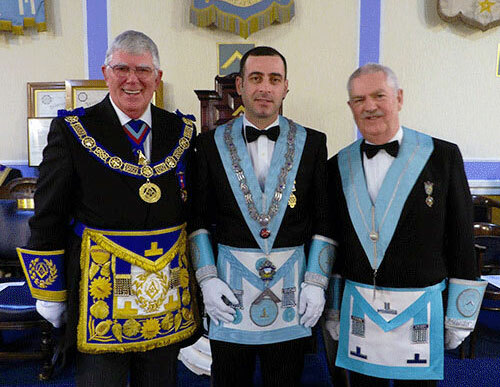 This is exactly what the members of Progress Lodge No 4120 did when Tony was the principal guest at the lodge’s installation meeting in which Marin Sirbu was pronounced the new master of the lodge in a delightful and stimulating ceremony. Following an efficient opening of the lodge, the dispatching of general business and progression through the three degrees by master of the lodge Michael Thorne-Hebson, the Provincial Grand Master was led into the lodge room with a fitting degree of decorum by Provincial Grand Director of Ceremonies Keith Kemp and his deputy Barry Fitzgerald and acting Provincial grand officers Godfrey Hirst, David Kenworthy, John Guest, Jim Finnegan, Philip Houldsworth and Joe Codling. Tony Harrison was accompanied by an entourage of distinguished Masons that included Assistant Provincial Grand Master Harry Cox, grand officers William Eardley, Keith Jackson and Blackpool Group Chairman John Turpin, along with Provincial Senior Grand Warden David Asbridge and Provincial Junior Grand Warden Peter Allen. On viewing the plethora of distinguished luminaries no doubt, the universe was temporarily thrown out of focus to Michael. The procession was impressive to say the least but extremely daunting to one of such modest character as that of Michael Thorne-Hebson. It had the effect of turning the spine into blancmange. It was not for an appreciable time that Michael composed himself and was capable of a warm and sincere welcome. But, Tony Harrison being ever better equipped with poise than Michael, was soon able to put him at ease. Courteously declining the gavel of the lodge, Tony settled himself down for a real peach of a ceremony. A host lodge with lively and agreeable inmates, willing to exert themselves to entertain visiting company, is well placed to ensure success at any ceremony. They belong to a group of hosts who adopt an ‘everything-must-be-done-perfectly’ philosophy. And it was with this ethos that Progress Lodge summoned its regiments in performing the ceremony of installation. Nevertheless, to say that the approach of this imminent ordeal left Michael feeling completely at ease would be to present the facts incorrectly. His diffidence was clearly evident at the commencement of the ceremony, but with gradually increasing confidence he progressed until his performance shone with vibrancy and authority. It was sincere, sensitive and delightful. Master elect Marin Sirbu proved his worth from the start with a perfect rendition of the master elect’s obligation, faultless, clear and with panache; even more amazing when one considers that English is not Marin’s first language. Originally from Rumania and having lived in Italy for a number of years before relocating to England, Marin’s linguistic skills have resulted in him being fluent in all three languages. As John Turpin later commented: “Many people whose native tongue is English could not have done it to that standard.” Marin captured the audience’s attention immediately. The excellence of Marin’s ritual set a benchmark that would be difficult to equal and, no doubt, motivated the brethren to aim for perfection. And that is what they achieved. When Marin had been deposited in the chair of King Solomon, the first test was placed squarely on the shoulders of Alistair Still when he was called upon to address the immediate past master and provide an explanation of the 47th Problem of Euclid; an exacting piece that is rarely heard. Alistair is not a man to shirk a challenging test and he clearly demonstrated his credentials as a renowned ritualist. ‘A quartet of working tools’: Pictured from left to right, are: Bob Hopwood, Jules Burton, Derek Donaldson and Trevor Holloway. Equalling Alistair’s example was Bob Hopwood in his delivery of the working tools of an installed master. Inspired by what had gone before, Bob delivered the piece with exactitude and zeal, leaving the multitude wondering how anyone could compete with such exemplary ritual. But compete they did. Effervescent Jules Burton stunned the proletariat with a dramatic rendition of the working tools of a master Mason. Animated and bursting with vim, Jules provided a masterclass in ritual. There followed two more brilliant performances when Derek Donaldson and Trevor Holloway blasted out the second degree and first degree working tools respectively. All three performances justly received the admiration of the masses. Calling on other members of the lodge, the impressive standard was maintained throughout the whole ceremony. 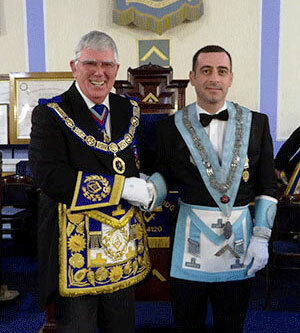 Scotsman Gordon Mclean brought more international flavour to the proceedings when he presented the warrant of the lodge and the pillar of the Ionic order to the newly installed master, demonstrating that the Caledonians can equal the Lancastrians when it comes to ritual. Gordon rounded off his party piece by presenting Marin with a Progress Lodge founder’s jewel, explaining that it has become a tradition of the lodge for every new master to wear it for the duration of his mastership. Provincial officers were not to be pushed into the shadows by the excellence of ritual from Progress Lodge members. 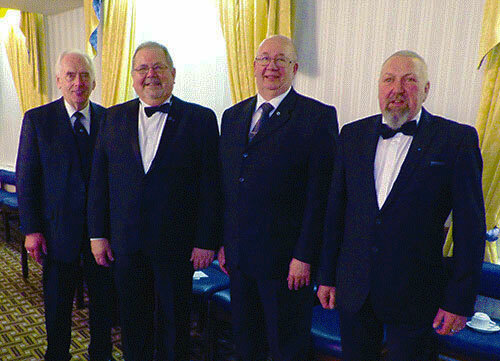 Provincial Senior Grand Warden David Asbridge and Provincial Junior Grand Warden Peter Allen came in strongly when they delivered the addresses to the newly-invested senior and junior wardens respectively. Both produced word-perfect narratives, delivered with conviction and sincerity. Indeed, Peter Allen reinforced his reputation with yet another faultless address to the wardens. Godfrey Hirst in full flow during the master’s song. But it wasn’t just the quality of ritual that made the installation so entertaining. The administration and choreography of the event was equally perfect. Director of ceremonies Andy Walch had brought all his vast experience and expertise to bear in organising his troops and, as one might expect, he handled the entire affair with consummate generalship. He also confirmed his well-earned reputation with a faultless address to the newly installed master. Roy James at the organ devised appropriate ditties throughout the proceedings. Roy is a remarkable musician with an endless repertoire of melodies – and not a single sheet of music to assist him at any time. His selection echoed the office, profession or a feature of character of each officer as they were invested by the new master, providing a continuous source of entertainment. The final address of the ceremony was, by tradition, reserved for the principal guest, and in addressing the members of the lodge, Tony defiantly demonstrated that he was up to any challenge that the brethren of Progress Lodge may have set him, (although he did admit to feeling under pressure). In addressing the new master after the conclusion of the installation ceremony, Tony remarked: “Blackpool has had a reputation for staging first-class shows in the resort for many years, but Progress Lodge’s installation today has been one of the best.” And it was at this juncture that he admitted that the quality of performances had put him and other Provincial officers under pressure. However, there returned a relaxed and leisurely mood when Marin presented Tony with charitable disbursements amounting to £1,200. An impressive £500 was destined to the Blackpool Masonic Hall Building Fund, £400 to the Masonic Charitable Foundation 2021 Festival, £100 to the Sponsored Walk, £150 to the British Heart Foundation and £50 to the local hospice. Throughout the ceremony, the audience demonstrated its support and enthusiasm. There had been no disapproving looks, no curling lips, no shaking heads and no twitching nostrils. Each of the proletariat had been engrossed and the lodge’s prestige had gained an A rating. Little wonder then that, at the conclusion of the meeting, they jauntily made their way down the passage to indulge themselves in a hearty dinner; a hot collation of roast beef and seasonal vegetables and having slipped a hearty fare into their abysses, it was time for the gathering to settle down for the customary toasts and speeches. Here too there was a perfect balance of humour and gravity. 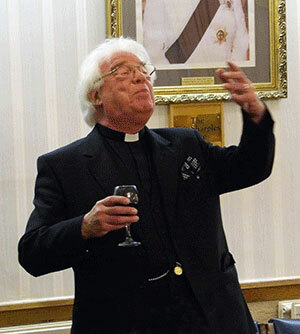 Harry Cox struck just the right chord in proposing the toast to the Provincial Grand Master and likewise, Tony continued in a vein of fun, mingled with solemnity in his response. 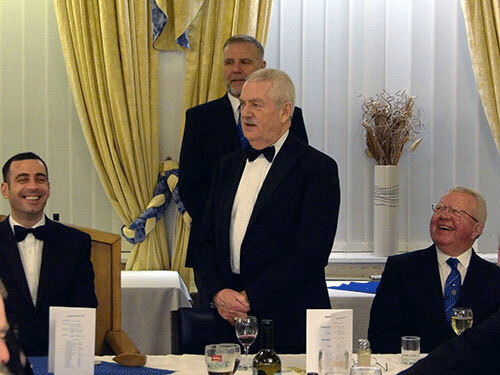 Provincial Senior Grand Warden David Asbridge maintained the mood and immediate past master of the lodge Michael Thorne-Hebson provided an ideal climax in his toast to the new master. Grand officers and acting Provincial grand officers with the new master Marin Sirbu and the installing master Michael Thorne-Hebson.